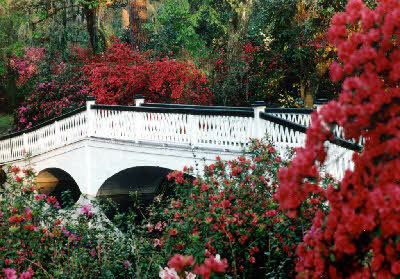 The gardens at Magnolia Plantation were first opened to the public in the early 1870s. However, many parts of the gardens are much older – some sections more than 325 years old – making them the oldest unrestored gardens in America. As the plantation has stayed within the ownership of the same family for more than three centuries, each generation has added their own personal touch to the gardens, expanding and adding to their variety. Today there are various varieties of flowers including camellias, daffodils, azaleas, and countless other species in bloom year round, with the climax building towards the spring bloom. There are more than 20,000 camellias from all the main species and hybrids on the property, with the collection mostly concentrated on 15 acres. Recent plantings are of sizeable camellias that are establishing quickly and already being used as reference sources for study by visitors. There is a register of all camellias on the property. Two of the original six camellias dating from the mid-1800s are still in place. The other four varieties were replaced many years ago with younger plants. 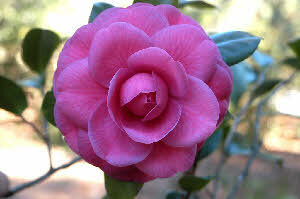 There are two speciality collections; a pre-1900 camellia garden and a hybrid camellia garden. A recently planted camellia species garden is becoming established and an additional area is being prepared for planting over 6,000 sasanquas. More than 150 camellia cultivars have been bred and named at the gardens. Escorted camellia walks are held daily from January to March and there are regular, well attended educational programs on such topics as grafting and camellia care. Research is also carried out or sponsorship provided to locate ancient and historic camellia cultivars in the U.S. and to propagate from them. 8 a.m. - 5.40 p.m.